New Zealand is part of the famous ‘Ring of Fire’, a region known for its high seismic activity and damaging earthquakes. This borders the Pacific Plate and includes many of the world’s greatest seismic and volcanic hot spots, including Indonesia, Japan, California, Peru and Chile. New Zealand is particularly earthquake prone because it lies on the boundary of two major tectonic plates – the Pacific Plate and the Australian Plate. The former is moving to the west at a few centimetres per year while colliding with the northward-moving Australian Plate. As these plates slowly drive against each other, subduction occurs. This is the process where one of the plates is pulled under the other and is consumed into the Earth’s interior. 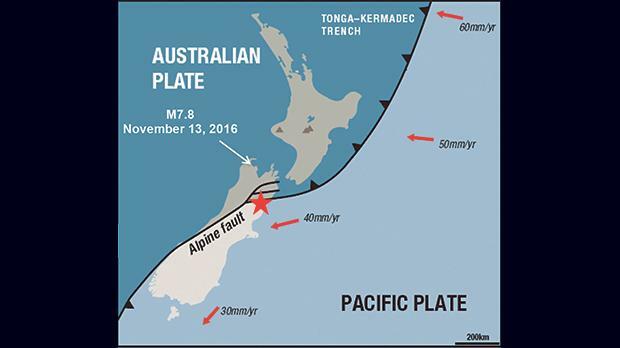 The interaction as these plates collide is responsible for much of New Zealand’s geography, such as the formation of numerous volcanoes. On November 14, New Zealand was struck by a powerful 7.8 magnitude earthquake which, as James Goff, a seismology and tsunami expert at the University of New South Wales in Sydney, says, is a reminder that New Zealand’s seismic activity “is a lot more complicated than we thought”. Since the earthquake’s epicentre was not on a known major fault, “we are finding out again that there is seismic activity that we didn’t really know about,” he added. Two casualties and heavy infrastructure damage were reported. The quake also triggered a tsunami of about one metre, which Goff says is unusual for a fault located beneath land. Some might wonder how such a large earthquake caused only a few casualties, when the 2011 magnitude 6.3 Christchurch earthquake left around 185 people dead. One of the key factors was the distance from major populated areas. The 2011 shallow earthquake struck very close to the city centre while the latest earthquake took place in a more rural area. Moreover, the 2011 disaster had more powerful high-frequency energy, lasting only a few seconds, while the latest earthquake was deeper and radiated energy of a lower frequency. A number of similarities exist in the Mediterranean region. For millions of years the African plate has been moving northward towards the Eurasian Plate, creating in the process a number of prominent features, such as the Alpine mountains and subduction zones. In the eastern Mediterranean, the Hellenic arc, representing the subduction of African crust below Greece, is one of the most active seismic regions, which has been the source of large-magni­tude earthquakes in the last hundred years of instrumental recording, and at least two historical events that were probably of magnitude over 8. In southern Italy, this plate interaction has also been responsible for the seismic activity in the central Mediterranean region. Malta lies on the relatively stable northern edge of the African plate (around 200 kilometres south of this plate boundary) where large-magnitude earthquakes are not so probable, although a number of smaller earthquakes in the region occur regularly and are also felt. However, in the past 500 years or so, a number of large earthquakes from both Sicily and the Hellenic Arc have been the cause of damage also on Malta, particularly the 1693 in Sicily and the 1856 earthquake that occurred in southern Greece. Pauline Galea is head of the University’s Geosciences Department. Daniela Farrugia is a PhD student at the Geosciences Department (Seismic Monitoring and Research Group).